Buy from Collected Works or your local independent bookseller. As a mediator committed to bringing people together and finding common ground, I can become discouraged by our increasingly polarized society, where fear and anxiety seem to be prime motivators. But over the past 25 years working on conflicts that seemed intractable, I have met some remarkable people who have taught me important lessons about resolving conflict and have given me reason for hope. 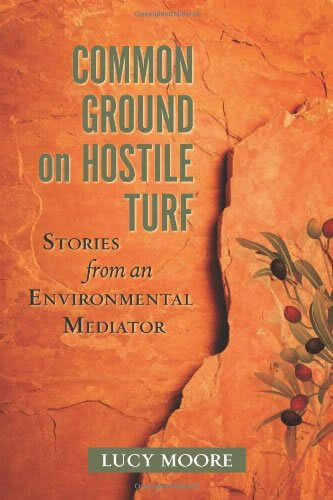 I have chosen ten of my most confounding and compelling cases to feature in “Common Ground on Hostile Turf: Stories from an Environmental Mediator,” (Island Press 2013). They include disputes over radioactive waste storage and clean-up, traditional rights to water and grazing lands, groundwater contamination, federal Indian policy, and more. The characters in these stories from the trenches of mediation include ranchers, environmental activists, civil servants, corporate spokespersons, tribal leaders, and traditional community members. After decades at the negotiating table, I have learned that success or failure is not found in facts, legal merit, or moral superiority. It is found in the personalities, the history, the courage and the fears of those at the table. Equitable solutions depend on a healthy group dynamic – one where honesty, vulnerability and respect can co-exist. I think you will find these stories all that a good story should be – engaging, moving and full of suspense. Lucy Moore, a creative and successful mediator, takes us inside the negotiating rooms and shows how listening, respect, and opening up are not homilies – they are the sturdy foundations for building true and lasting results. Lucy Moore is an environmental mediator with decades of experience in the American Southwest and great stories to tell. In fact, storytelling is the key to her success… As she explains with great impact and poignancy, the only way to help people enmeshed in difficult conflicts is to get them to share their stories. Newcomers to the field will learn invaluable lessons from Lucy’s firsthand accounts.